Michigan State University is initiating a sweet friendship between military veterans and honeybees. Heroes to Hives teaches veterans beekeeping skills as a path to personal and financial wellness. 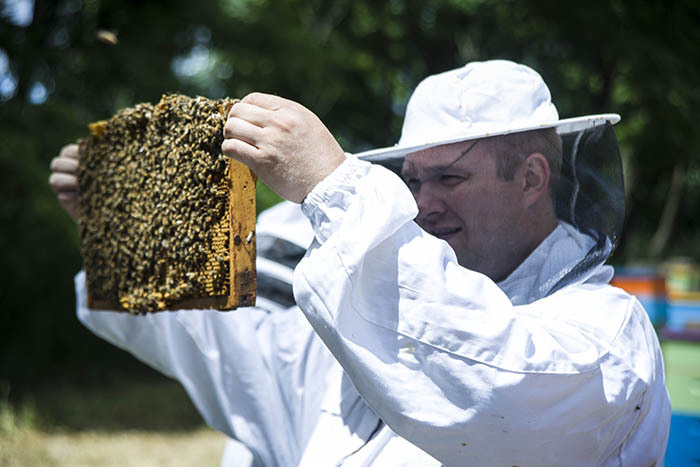 Adam Ingrao, an Army veteran who is an agricultural entomologist educator and veteran’s liaison at the East Lansing university, started the program in 2015 to merge his passions of working with veterans and beekeeping. Ingrao has been involved in agriculture since he was 14 and manages bees on his Lansing community garden plot, Bee Wise Farms. He sees the course as a transformative opportunity for veterans. A big emphasis is the program’s community development aspect that leads to personal wellness and empowerment, Ingrao said. “It’s about getting veterans together that have shared experiences and often times feel isolated in society, getting them together with other veterans so that they can be part of a community that they lost,” he said. And the program leaves participants with a strong knowledge of beekeeping, a profitable business when you know how to do it right. The vets are introduced to a strong network of industry connections. 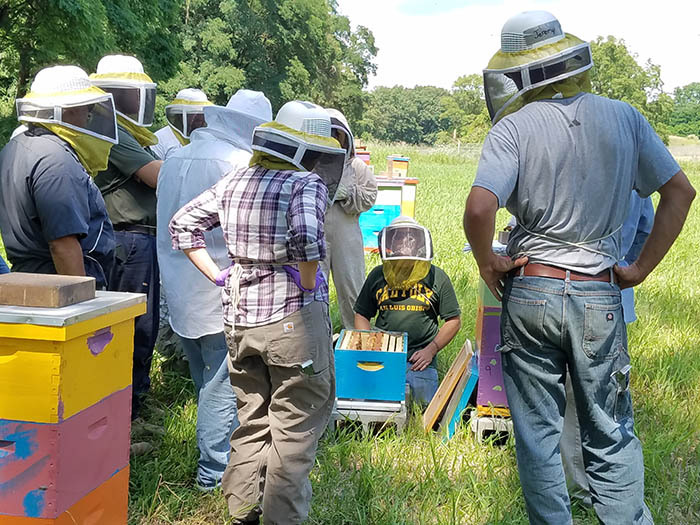 It is an immersive 9-month course where students get first-hand experience dealing with bees, said Jeremy Huffman, a former marine and a bee farmer who participated in the program last year. Out of Huffman’s class of 15 students, all but one went on to their own bee farming operations. Heroes to Hives graduates have the skills and connections to go on to commercial beekeeping operations, own their own small businesses and diversify their farm income, Ingaro said. This is the hardest time to be a beekeeper due to the unprecedented rates of loss and the fewer healthy habitats to keep bees, said Meghan Milbrath, coordinator of the Michigan Pollinator Initiative, a Michigan State University program that addresses Michigan pollinator-related issues. 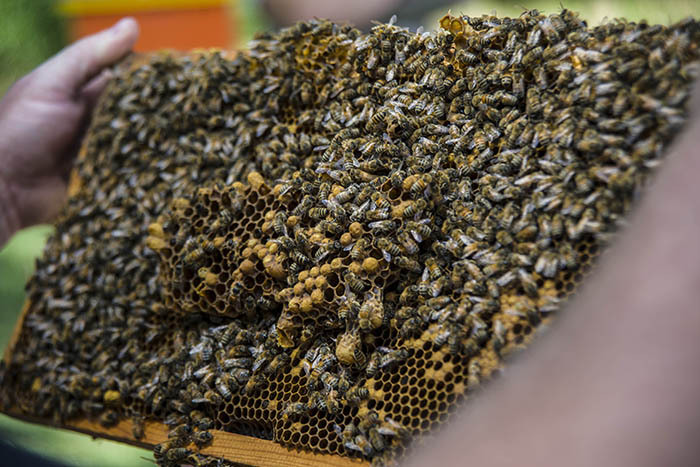 Beekeepers are reporting 30 to 40 percent losses in their colonies each year due to increased pests, pathogens, poor nutrition, misuse of pesticides, improper management and habitat loss, according to the Michigan Pollinator Initiative. The course helps with the sustainability of honey bees by teaching beekeepers to effectively manage these challenges. “When you teach people about bees, the more they start to care about the issues and make changes,” Milbrath said. And you create beekeepers rather than beehavers. Heroes to Hives produces keepers rather than havers, he said. Participants learn about hive management in lectures and hands-on hive handling. In addition to sustaining honey bee farms, participants also learn how to preserve healthy habitats that support wild bee populations. This helps “the plight of the pollinator,” Huffman said. The program has expanded from just 15 participants in 2017 to 108 this year. It is on track for over 200 next year. Ingaro is excited that Heroes to Hives will accept students nationwide in 2019, an expansion made possible by online classes and additional locations in the Upper and Lower peninsulas. The program is fully funded by the AT&T Foundation and other private donors. Veterans and veteran family members can enroll online, and all applicants are now accepted. As Heroes to Hives expands, it fosters a mutually beneficial relationship between veterans and honeybees, Ingaro said. Honeybees are helping veterans heal while veterans are helping honeybees survive. This story was updated Nov. 19, 2018, to correct the spelling of Ingrao.